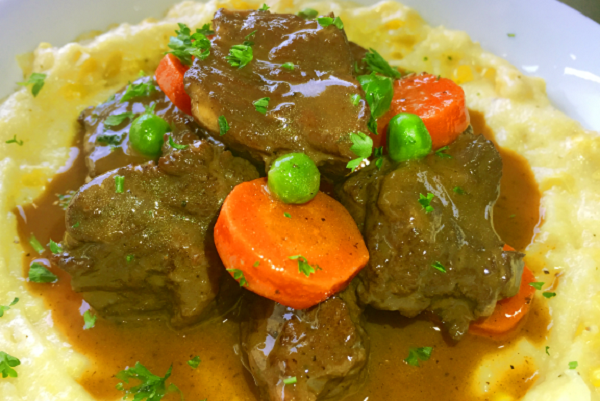 Chuck roast simmered slowly for hours until it's melt-in-your mouth tender together with delicious carrots and peas served over hearty polenta. Serve up "supper" fast with this traditional comfort food that's ready to reheat. 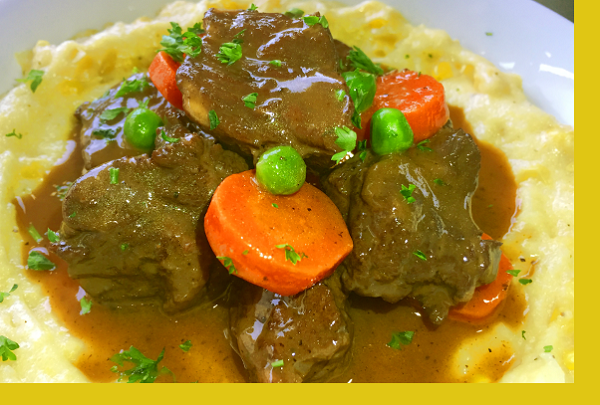 Beef Stew: Microwave: Reheat stew in the microwave on HIGH POWER for 3 to 5 minutes checking regularly. Stove: Reheat stew in a sauce pan on medium-high heat. Polenta: Add corn pack to sauce pan and saute for 2-3 mins on medium heat. Add polenta pack together with 2.5 cups of water per 2 servings. Bring to boil and stir making sure chicken cube dissolves. Cook for about 5 minutes on medium heat until water is absorbed. Mix in cheese mixture and stir until cheese melts. Serve stew over polenta. Mom raved about this meal!